The very rare Madagascar or Bernier’s teal (Anas bernieri Hartlaub 1860) is one of the rarest ducks and, till some time ago, less known. Enedemic to Madagascar, it belongs to the order of the Anseriforms (Anseriformes), to the family of the Anatids (Anatidae), to the genus Anas and to the species Anas bernieri. The name of the genus “Anas” comes from the Latin terms “anas, anatis” simply meaning “duck”; the species “bernieri” is honoured to Chevalier J.A. Bernier, surgeon-naturalist who carried collector activity in Madagascar, between the 1831 and the 1834. 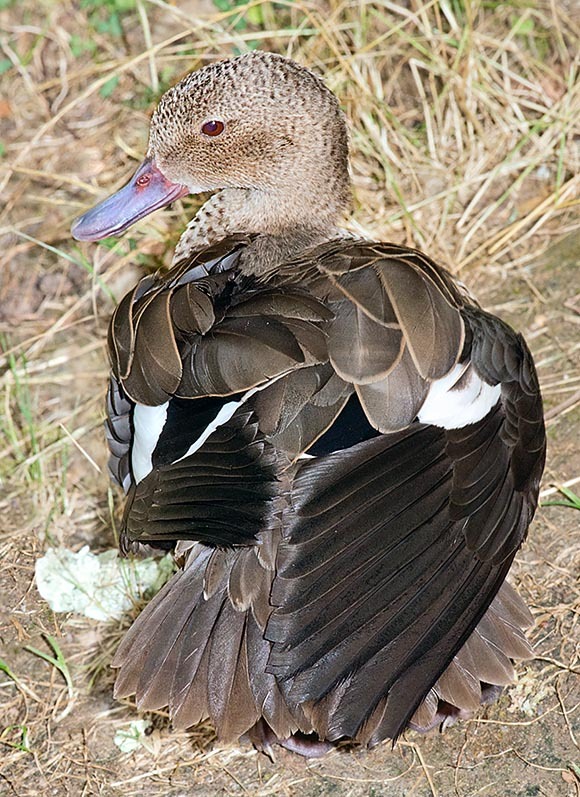 The stronghold of this species stands in the western part of Madagascar, in the district of Antsalova, where this sedentary duck appears to be substantially confined in the coastal lakes. Also in this zone, the few locations still available to the species are practically under siege. Flooded grasslands, ample belts of mangroves, and generally humid zones were the most suitable areas for the species. Unfortunately, these habitats have been rapidly exploited by man. 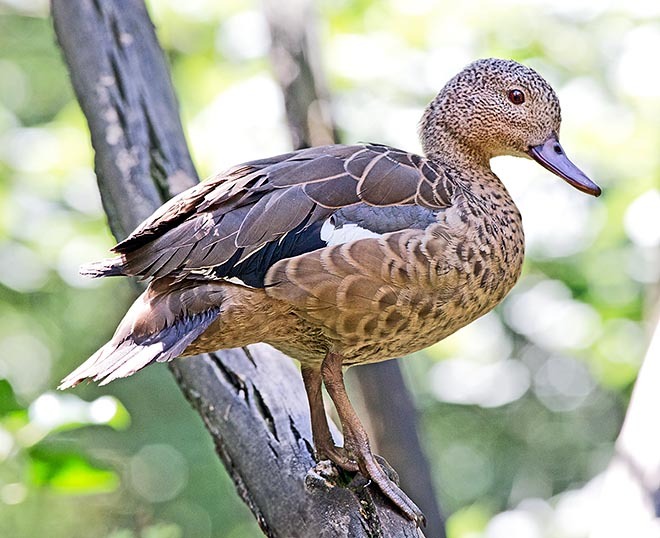 Now, the Madagascar teals are limited to frequent shallow lakes, brackish swamps of remaining mangroves, open ponds and the estuaries of the rivers with sand banks. They do not love the deep waters and the abundant marsh vegetation. It has a length of about 40-45 cm, weight of about 400 g, and a livery of prevalent warm brown-reddish colour; head and lower parts are more faded in hazel with many sub-terminal dark brown marginations which are wider on the sides. If seen closely, the livery has overall a dotted-maculated look. The dorsal feathers are dark brown with narrow hazel margination. The wing has brown-greyish coverts and remiges, as well as the rectrices (less greyish). The secondary remiges form an ample black-velvety speculum preceded proximally by an ample white band ending in a margin of the remiges, white too. The bill is grey-pinkish (nail and nostrils are darker), slightly bent upwards which, together with the lively eyes and the front slightly domed confer a sympathetic expression of the head and the face, which reminds (thanks also to the habits and to some gestures) a small brown shelduck. The neck is slightly elongated. The iris is brown-red. The legs are greyish-pink. The sexes are similar even if the males have usually brighter-more luminous liveries, head and size slightly bigger. The Madagascar teal, though active during the whole day, is livelier in the morning and in the evening. They may feed also during the night, especially in case of full moon. During the warmest hours of the day, usually, they stay idling on the sandy banks or spend their time quarrelling with conspecifics. Whilst for this species the gathering in flocks is rather atypical, at times the Madagascar teals have been sighted together with other species like the red-billed teal (Anas erythrorhyncha) and the well known whistling ducks (Dendrocygna bicolor and Dendrocygna viduata). These ducks do not particularly love swimming and feed in the shoals and puddles like the shelducks (Tadorna tadorna). In a study done on the Bemamba Lake, it has been noted that the 70% of the time passed in feeding was spent wading quickly very shallow waters. While nourishing, they are always moving usually shaking up the mud with the bill, neck stretched, moving the head from one side to the other with a typical sieving movement. The fact of dedicating much time to the research of the alimentation might indicate that the food, at least in some periods of the year, is scarce, poorly nutrient or much dispersed. Often the ducks quarrel among themselves defending the own zones of feeding. The diet, though not much known, is mainly formed by insects and aquatic molluscs and some types of vegetables, in particular seeds of aquatic plants. The Madagascar teal is normally sighted in pair; it is thought, therefore, that the pair bonds are strong and stable. The nest is placed among the tangle of the mangroves or inside tree cavities. Suitable natural cavities, furnished mainly by the grey mangroves (Avicennia marina), have been found at 1-3 m over the water surface. The hatching type is formed generally by 6-7 (4-10) eggs. The shell is yellowish-buff. The eggs are incubated, by the female, for about 4 weeks. In the ducklings the upper parts are brown and the lower and lateral ones are yellow-whitish: on the back run two whitish lines. The species, before the arrival of the man (about 2000 years ago) was much more numerous. Their drastic reduction may be partially due to the desertification caused by the climate changes. The main reason of this is in any case to be ascribed to the destruction of the habitat done by the continuously expanding human population. Also the diffusion of pesticides and various pollutants, besides the introduction of fish species which subtract the nourishment to the endemic species, are serious dangers for the perpetuation of the species. 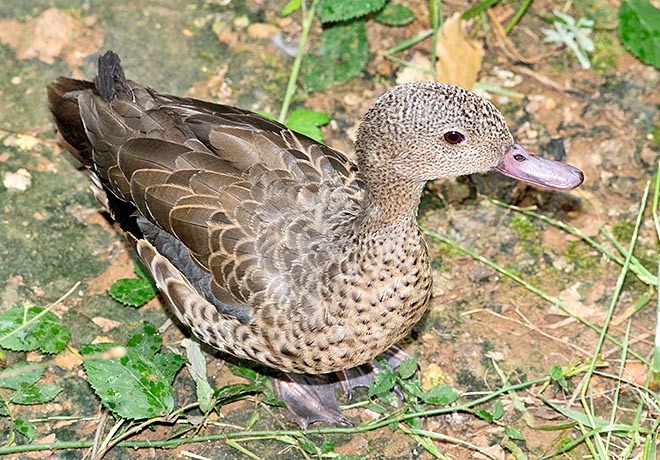 The Madagascar teal is a highly endangered species; already in 1930, it was rare and localized. From the seventies onward only few tens of specimens have been sighted. It is thought that there are, at most, some hundreds of specimens (100-500) between Antsalova and Morondava, plus some other specimen scattered in other localities. The explosive growth of the human population in Madagascar has had and continues to have a devastating impact on this former heaven on earth. The Madagascar teal being indissolubly linked to the extremely precious habitat of the mangrove swamp, one of the ecosystems mostly damaged by the human activity and greediness, might become on of the animals symbol for the protection of these frail and enchanting habitats. The reproduction in captivity is to be considered as very important for contrasting the decline of the species. In Great Britain, the zoo of Jersey (Jersey Wildlife Preservation Trust) breeds this species, as well as others considered as “minor” by the human superficiality, since some tens of years. The hope for the future is that, at least in captivity, the species may always be increasingly bred and distributed.